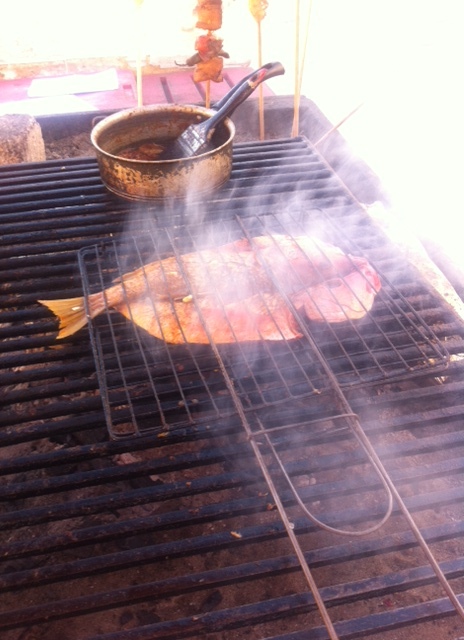 Every day from ten to six Vicki cooks fish at the edge of Los Muertos Beach. Her sign reads “Mariscos bajo el Puente” (Fish Under the Bridge), with her kitchen under a low concrete bridge. She stands in soft sand up to her ankles working at a clean oilcloth-covered table lined with seasonings, water jugs, a cutting board, and a couple of knives. Just alongside the bridge her rusted iron “range-sized” grill holds a blanket of smoldering charcoal under a heavy grate. We order a whole red snapper for dinner, and I wade through sand to observe Vicki. She lifts a shiny red fish from her cooler, flicks off the scales, splits it open along the spine through the belly and head, opening the snapper like a book. She holds the open fish over the sand while she asks me to splash on enough water to wash away blood. She gashes the spanking clean fish twice on each of the skin sides. She sprinkles the inside with salt, pepper, bottled red chili sauce, and Maggi sauce (which alas contains MSG and is sort of a fermented wheat soy-like condiment used in Mexico and called “English Sauce”). She also seasons the skin side, then chops two large cloves of garlic, and stuffs bits into the skin-side gashes and into any crevices on the flesh side. Next, she opens a wire hinged grill cage, places the splayed fish inside, slides down the clasp, and sets the fish over glowing coals. On the edge of her grill there’s a saucepan of melted butter seasoned with garlic and fresh bay leaves. Vicki wields a large paintbrush dripping with this seasoned butter and glosses both sides of the fish as it faces the fire. We sit on plastic chairs watching smoke curl. Tantalizing aromas of butter, smoke and garlic mingle. While the snapper cooks for ten minutes on each side, Vicki chops tomatoes, cucumbers, cilantro and chilies for a salsa-like salad, and warms a stack of corn tortillas. Her grandchildren play in the sand, her daughter takes orders from other customers, while her husband carries the till in his waist fanny-pack. As the sky grows rosy with sunset, our steaming fish is ready for the plate. We bid goodbye to the family and walk up the beach to dine on a balcony as night falls. You are currently browsing the Mary Jo's Kitchen blog archives for January, 2015.